Mariner’s Church fascinates me to no end. One day I will make it here for a worship service. It’s a lovely building with quite a history. It sits on Jefferson Avenue, between the Detroit River, the Duty Free Shop and customs area for the Detroit-Windsor tunnel, and old City-County Building. In August 1818, Julia Ann (Taylor) Anderson came to Detroit with her new husband, Colonel John Anderson, and her sister Charlotte, when this city was still a frontier emerging from the traumas of fire (1805), war (1812-14), and famine & plague in the 1810’s. Colonel Anderson, a West Point graduate, was commissioned to open the initial precursor to the Army Corps of Engineers on the upper Great Lakes, and they acquired a double lot by the Detroit wharfs near the foot of Woodward Ave.
With the opening of the Erie Canal, the invention of steam-powered boats, and the burgeoning of Detroit, Julia Anderson and her sister Charlotte observed increasing numbers of seamen traverse the city. These sailors were too often marginalized and treated as outsiders—relegated to the back of society, and literally, to the backs of churches. With a heart of compassion Julia Anderson (a widow since 1834), willed in 1842 that her “lot on the corner of Woodward Avenue and Woodbridge Street in Detroit become “a site for a Mariners’ Church…” She also specified that it be a stone church (built for the ages), with “forever free” pews so that mariners would not have to be relegated to the back. The church was thus constructed on the site of Julia Anderson’s mansion and its exact size was dictated by the lot on which her mansion stood. Initially organized in 1842, within a year Mariners’ commenced upon its mission to watch over the spiritual well-being of sailors and the greater community, and the current stone structure was consecrated in 1849. Before long Mariners’ became a point on the Underground Railway, assisting the freedom of former slaves through a tunnel from its basement to the waterfront. Through the years many tenants occupied the bottom floor of Mariners; this was anticipated to pay the the bills, for it was known that as sailors could not afford pew rentals, neither could they give sufficient tithes to maintain the parish. Detroit’s plans for revitalization needed the church’s Woodward lot, and some began calling for the building’s demolition, but the citizens of Detroit had a better idea. Remarkably, the stone 3000-ton building was moved 900 feet east to its current location in 1955 to make way for a new civic center. Its current location is the site of the U.S. Topographical Engineers office (precursor of the U.S. Army Corp of Engineers), which itself was the site of the Old Indian Council House. On November 11, 1975, former rector, Bishop Richard Ingalls, Sr., rang the church bell 29 times in memory of each sailor lost in the sinking of the giant ore carrier Edmund Fitzgerald. This act was immortalized in the ballad, “The Wreck of the Edmund Fitzgerald.” His son, Father Richard Ingalls, Jr., followed his father as rector in 2006. An important and unique aspect to Mariners’ is that it is the only Michigan Church incorporated by an act of Legislature. 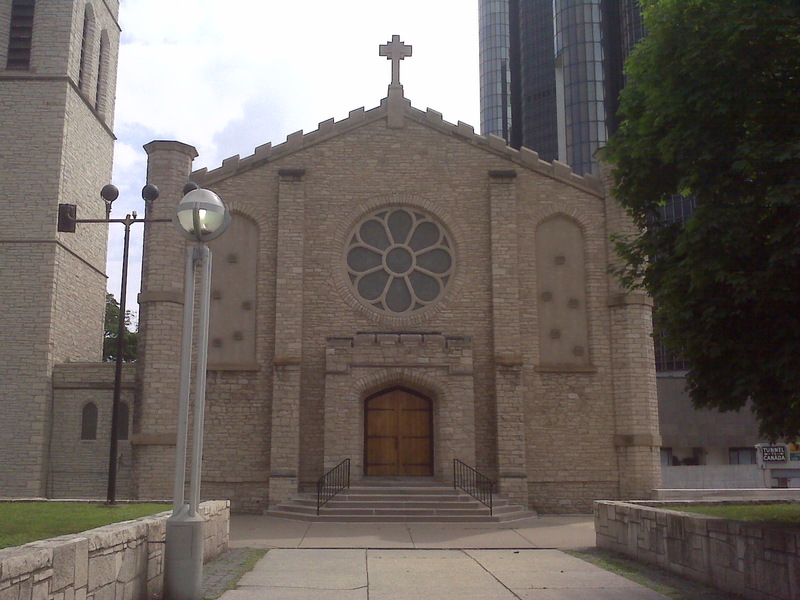 The Trustees of Mariners’ Church of Detroit were formed under the Act of Incorporation, No. 142 of 1848, by the Senate and House of Representatives of the State of Michigan–and which Act has neither been amended nor repealed. Mariners’ has continuously served the community as a church in the Anglican tradition, governed independently. Of course, independent ownership and governance do not negate our apostolic ties, as we are members of the One, Holy, Apostolic, Church; gratefully cooperating with continuing Church bishops in the apostolic lineage.